Wausau, Wisconsin (July 2016) - Opened for the 2015-16 academic year, the University of Washington-Tacoma (UW Tacoma) completed its reconstruction and renovation of the 120-year-old McDonald-Smith Building located in the Union Station Historic District. Meeting the historic aesthetic and modern performance needs, Mission Glass installed more than 116 of Wausau Window and Wall Systems’ 4250i-XLT Invent Retro™ Series simulated double-hung, arched top, fixed windows. Established in 1990, UW Tacoma provides an 18:1 faculty-student ratio for a total enrollment of 4,629 first-year to graduate students. The 46-acre campus consists of 21 buildings with a total of 627,664 square feet of active space. Much of the space is nestled in converted landmark structures built in the late 1880s through the early 1930s at the western terminus for the transcontinental railroad system. Today, many of these structures are overseen by the Tacoma Landmarks Preservation Commission to ensure renovations meet with the Secretary of the Interior's Standards and Guidelines for Rehabilitation of Historic Buildings. The historic, four-story McDonald Smith building was built in 1892 for E.A. McDonald and F.C. Smith who were in the wholesale hay, grain and feed business that flourished along Pacific Avenue at the end of the 19th and in the early 20th centuries. Like several of its neighbors in Tacoma’s Union Station Historic District, the Younglove Grocery Company later acquired the building for its operations. Most recently, the building had been converted into mixed-use artists’ housing and retail spaces. In 2006, UW Tacoma purchased the McDonald-Smith property. In 2014, it was one of two remaining landmark buildings on the campus awaiting renovation. As part of an $11 million renovation project the university has modified the existing historic building for additional office and meeting spaces to support the continued campus growth. Connection to the adjacent, renovated Cherry Parkes building integrates the space within the Tacoma campus. “The renovation of the McDonald-Smith Building [feels like a natural extension of the University of Washington Tacoma campus; honoring the heritage of the Union Depot historic district by breathing new life into an aging building,” according to UW Tacoma’s Division of Finance Administration’s Campus Planning Real Estate unit. Planning and design for the project started in 2014 led by Bassetti Architects as guided by the campus’ master plan. The project’s design-build reconstruction team also included M.A. Mortenson. Working closely with Bassetti, Mortenson and Wausau, glazing contractor Mission Glass began its fieldwork in Sept. 2015 and completed the historical window replacement in just one month. Along with the window replacement, the building renovation includes a new mechanical and electrical system, code required structural upgrades, a new roof, structural openings to tie the building into the neighboring Cherry Parks building, and a renovation of approximately 30,000 square feet on floors 1 through 3 with faculty offices and seminar space. The Landmarks Preservation Commission uses the Union Station Design Guidelines to evaluate the appropriateness of proposed alterations. To meet the guidelines and address the Commission’s concerns, several options were researched. Bassetti, Mortenson and UW Tacoma’s Milt Tremblay, director of physical planning and sustainability, and Jeannie Natta, project manager of major capital projects presented their recommendations to the Commission. These advantages included: “superior craftsmanship, similar sightlines, closer brickmold profiles” and “fewer long-term warranty issues.” Natta emphasizes that the “continuous clean edge” of Wausau’s extruded aluminum windows was especially appealing in matching the historic look. To fabricate the windows’ arched tops, Linetec handled the stretch forming to curve the 4-7/8-inch-deep aluminum frames. It painted the frames and trim in a Black Panther color. Using a two-coat, 70 percent PVDF resin-based coating, Linetec helps extend the window systems’ lifespan and reduce maintenance costs. It also provided the extra-wide polyamide thermal barriers. Combined with high-performing glass, this helps Wausau’s INvent windows achieve NFRC U-Factors as low as 0.35 BTU/hr-sqft-ºF with Frame Condensation Resistance Factor (CRFf) of 61 and higher. “The high-performance glass and aluminum frames with thermal barriers improve tremendously on the former windows’ performance,” reiterated Wilkowski. Wausau’s INvent Retro Series windows are AAMA AW-100 Architectural Performance Class rated. These products are tested to meet or exceed AAMA 910-10 lifecycle testing to 4,000 operating cycles and stringent requirements for air infiltration, water resistance, life cycle testing and structural integrity. They also offer acoustic performance with Sound Transmission Class (SC) ratings of 31 to 42, further improving the students’ interior comfort and concentration. Reconstruction of the McDonald-Smith building at UW Tacoma follows a master plan established for campus in 1997. It has earned nationwide recognition for architectural excellence and historic preservation. The campus received the 1999 Honor Award for Regional and Urban Design from the American Institute of Architects (AIA) and an award from the National Trust for Historic Preservation. • AIA judges noted that the UW Tacoma campus is the centerpiece of an urban renaissance, combining culture, education and commercial revitalization with a grand program of historic preservation. The Sierra Club also recognized UW Tacoma campus in 2005 as one of the nation’s 12 best new developments. The group said the campus is “a bustling addition to Tacoma,” bringing thousands of students, faculty and staff to the neighborhood each week and adding to the growing demand for retail, housing and further development in the area. The Sierra Club noted UW Tacoma’s reuse of existing buildings and partnerships between city, state and community groups have created an accessible, pleasant urban campus. 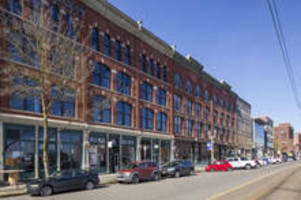 “Whether the project demands historical accuracy for preservation, historical inspiration for renovation, or a sleek and modern style for new construction – Wausau is able to apprise and bring the right solution of products and support to match the architectural vision, execute sustainable goals and the highest performance requirements,” concludes Wausau’s architectural sales representative, Brad Glauser.